I am delighted to report that we are finally cracking on with our DIY projects in our new home in a hope to spruce it up before our first Christmas here. I think, as it’s a big project, we might just leave the lounge until the new year, because I want it to be right and not rushed! But at the top of our list was to organise the porch/entrance hall as you will see from the below picture I took, it was complete chaos and on some days it was a bit of a struggle to even open the front door! 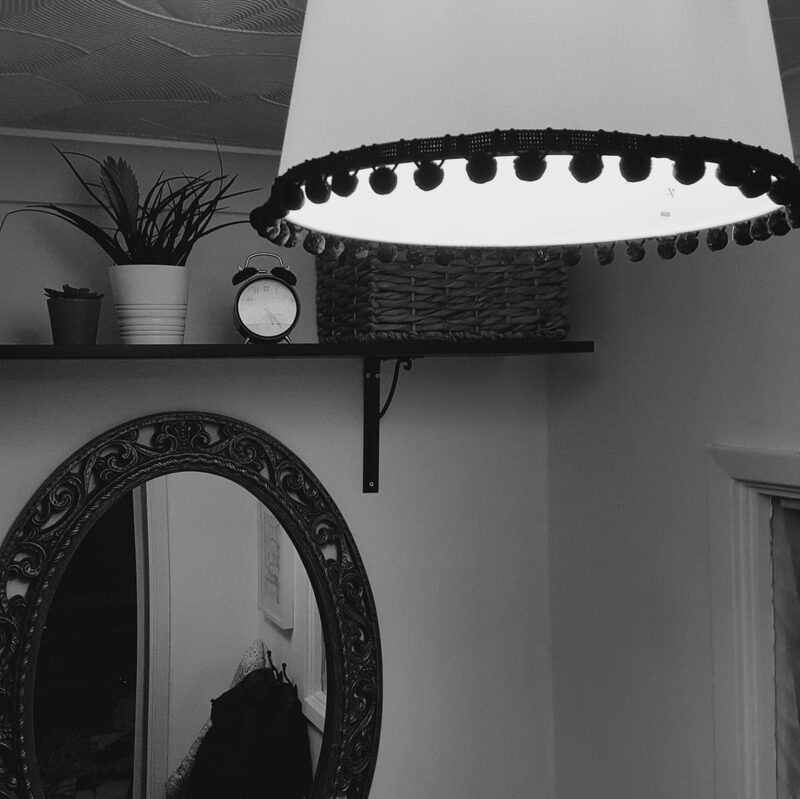 It now looks so much better and I couldn’t be happier – this little space makes me so happy and it wasn’t very expensive either, as in true frugal style… most of it was from Gumtree or Ikea. For so long I have wanted an area to keep shoes and coats. A place to walk in and kick off our shoes before going into the lounge. Our old house was a back to back and we were constantly cleaning mud off everything!!! The coats were hung by the door, but that also meant they too were in the lounge and it just felt messy and all out of sorts. I LOVE that now we have a porch/entrance way … separate to our lounge where we can store wellies and shoes, coats and bags. 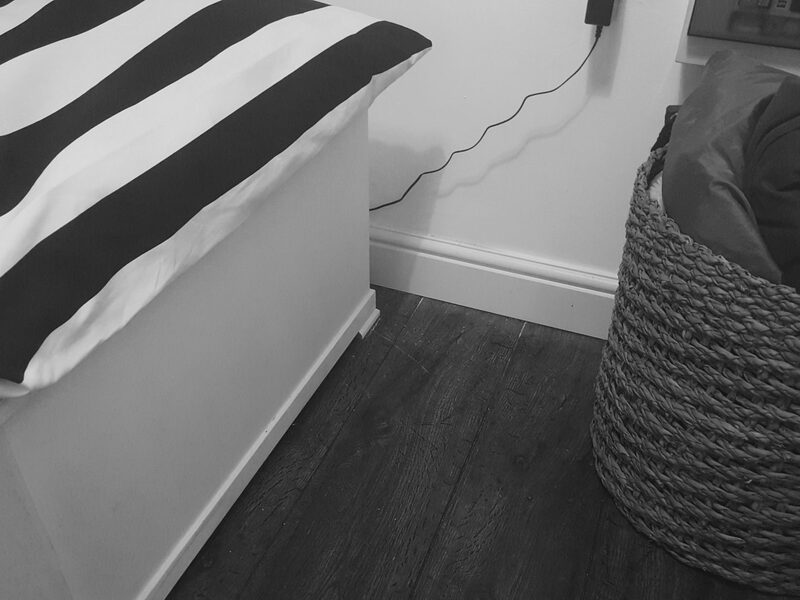 I originally wanted a locker room style hooks, and have a really colourful wallpaper, however we realised this would be too faffy and so instead opted for white walls (as its a little dark in there), and then with that I wanted to incorporate the lovely black and white stripe fabric from Ikea, so that kinda created an immediate monochrome look! 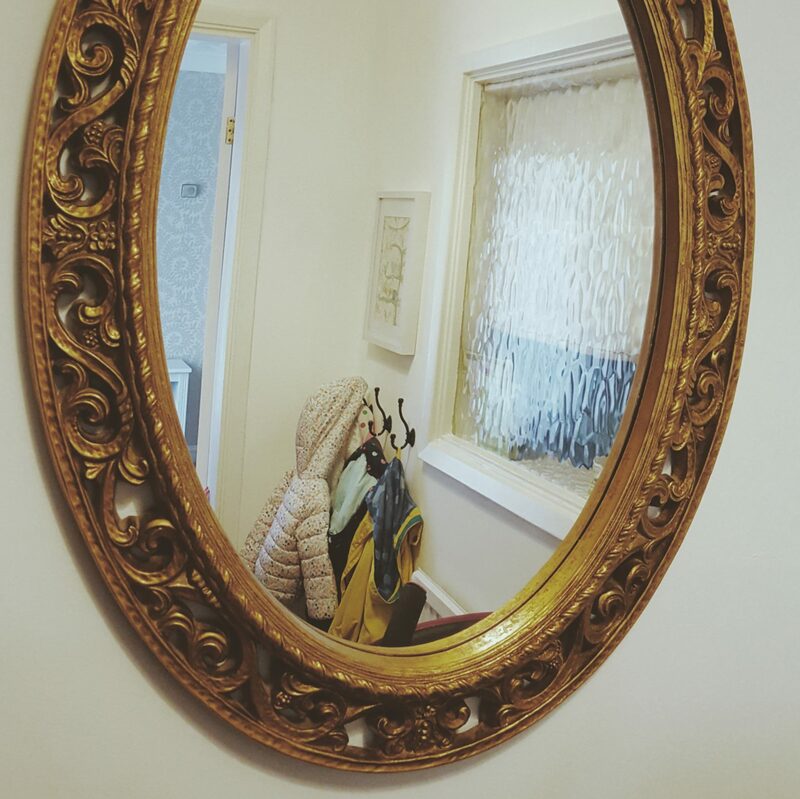 I wanted an oval or circular mirror and found this amazing one on Gumtree for £20 which I just love! 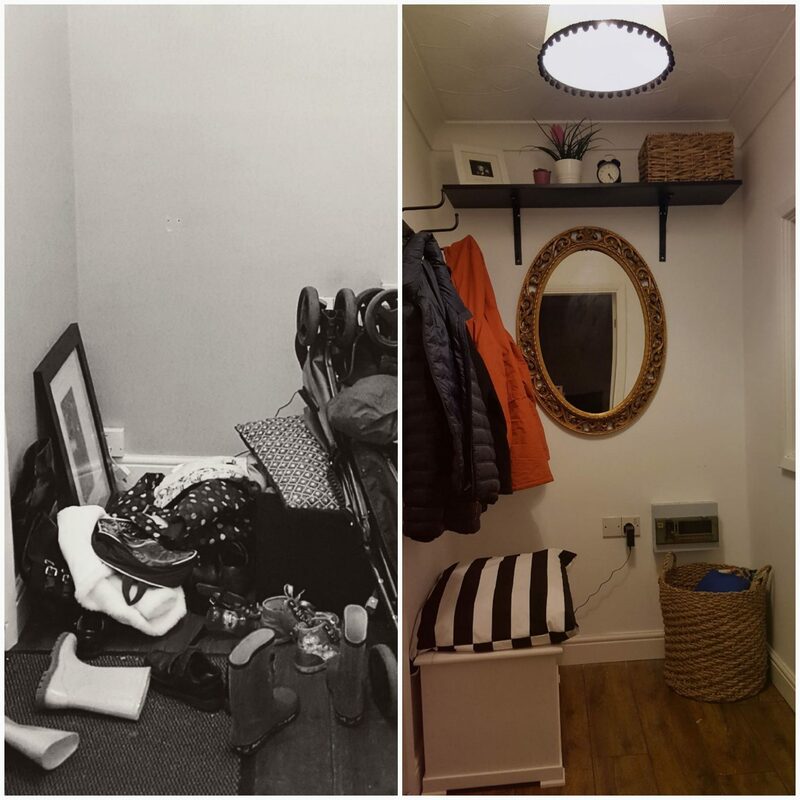 We bought the storage box on Gumtree also for £25, and then the hooks, shelf and fabric for the cushion are from Ikea! I saved money and made it my own style by making the cushion on top of the storage box. 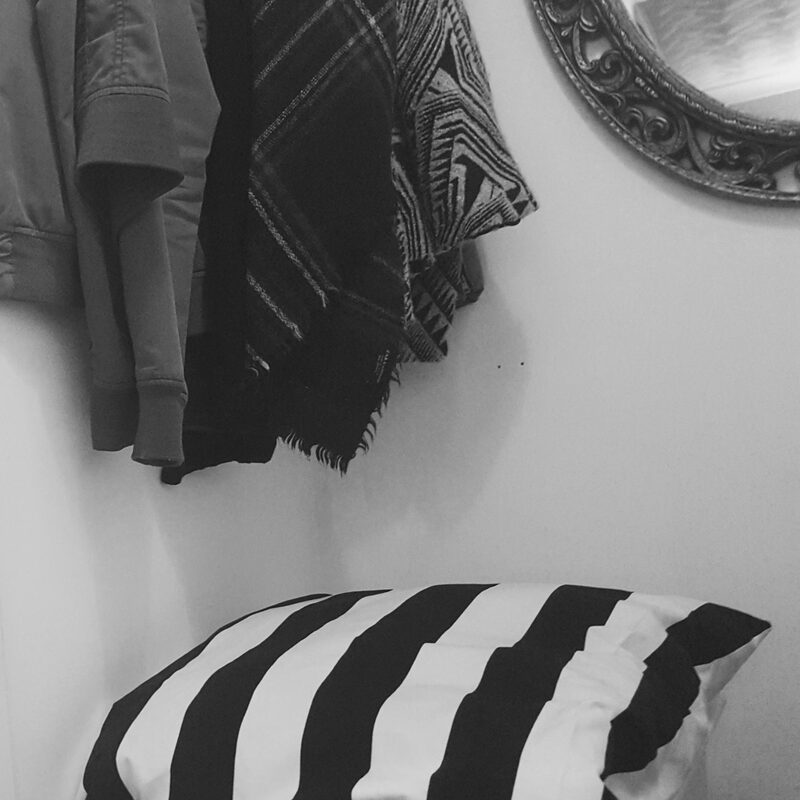 It only took me like 10 – 15 minutes to do and I like the pop of pattern in the room. The baskets are both from Homesense – The smaller one on the shelf was £9.99, and the bigger one in the corner was £14.99! I had some love2shop vouchers so I guess technically they cost me nothing. 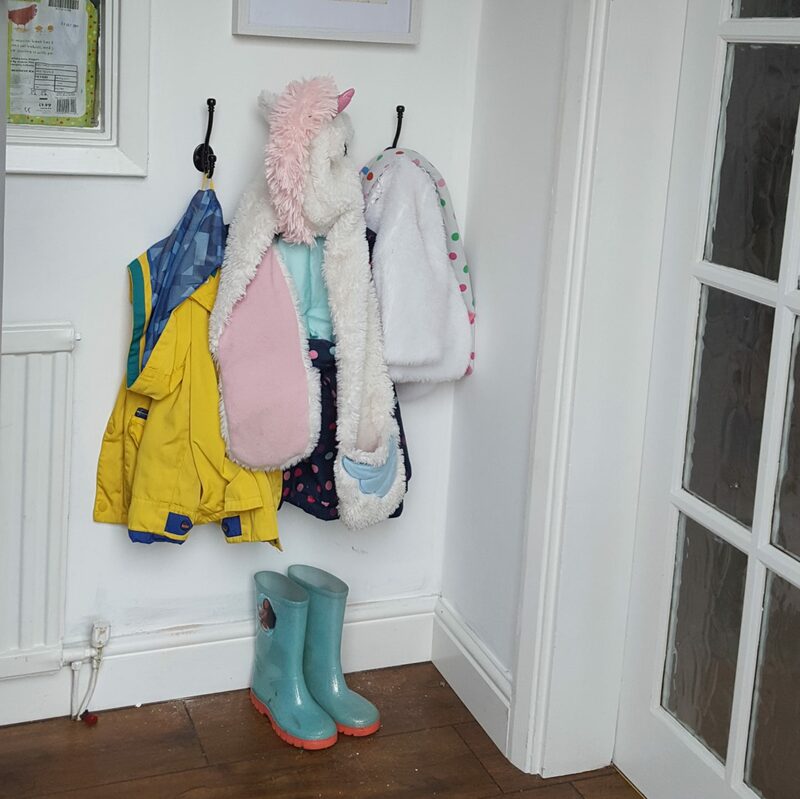 Finally, taking inspiration from my sister in law, I decided to put 3 little hooks down low for the kids which they absolutely love too, and they have been eager all week to actually hang their coats up after school – SCORE! These were from the Yorkshire shop Boyes for £2.60 each. My most favourite touch to our porch is my lamp shade. Firstly because it is blumming awesome, and secondly because it was a right bargain too! 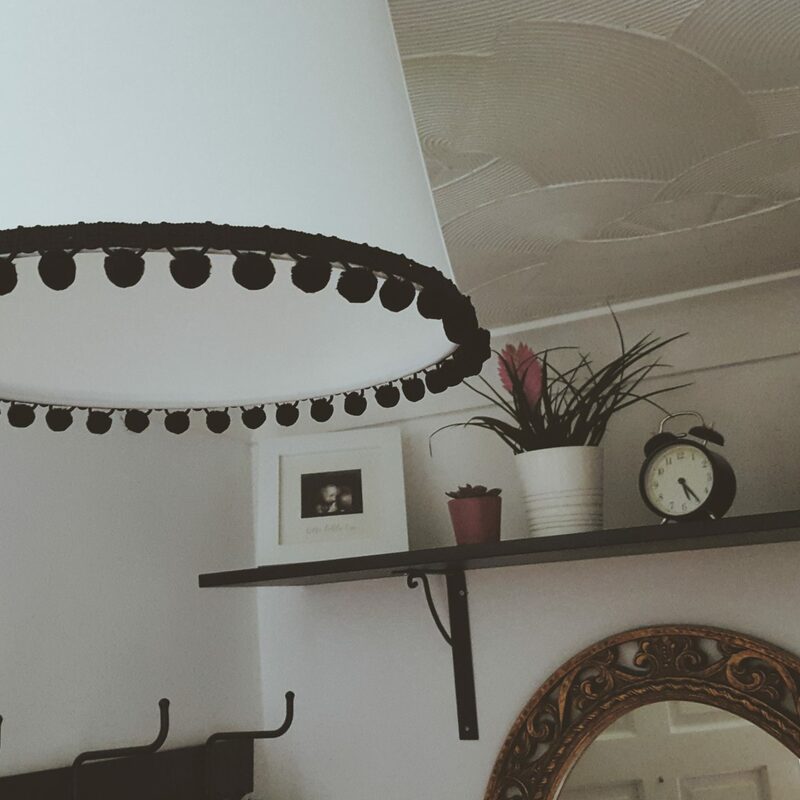 The lamp shade is from Ikea and when I bought it earlier in the year I only paid £2.50 for it (I believe they’re about 3 now!). Then, with inspiration from my mother in law, I bought just over a meter of black pom poms from BOYES which cost £2 and glued them round! I just love it – and it adds a little something funky! So lets get our craft on and make one. 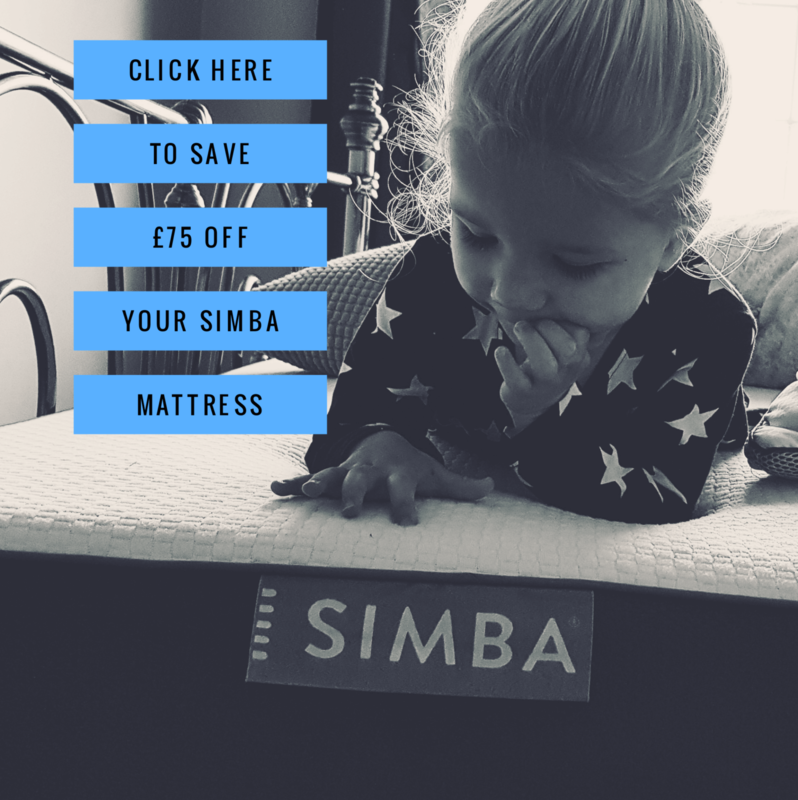 It is really simple and quick if you have everything organised. To start just get the shade you want and then choose your pom poms (colour/size) from a local haberdashery (or ebay have them too). I think a crazy pattern one would look cool with bright pom poms if you were feeling ambitious! 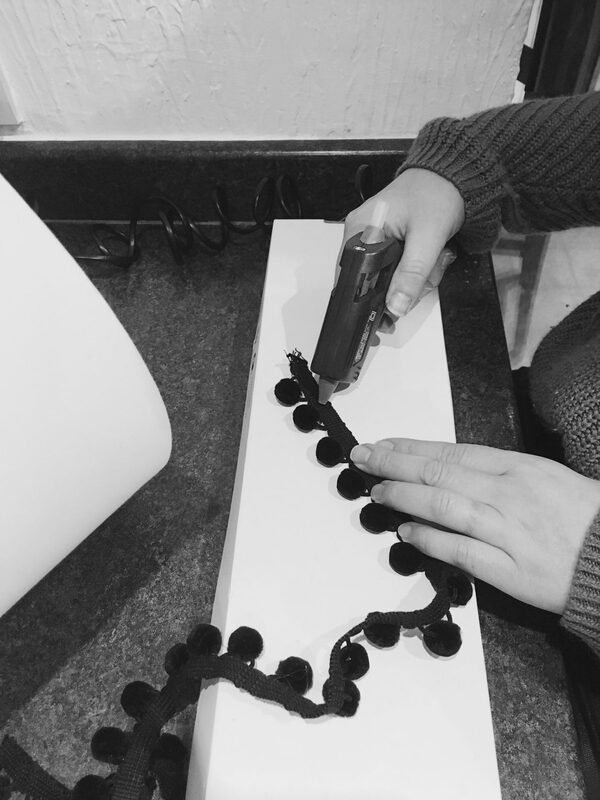 Next using a glue gun, just carefully glue small sections to the bottom outside edge of the shade and stick it round a little at a time, making sure the cord marry’s up with the edge of the light shade so as to be neat and professional! Once you have gone all the way around cut off any remaining pom pom cord and stick the two edges so as to not look tatty. 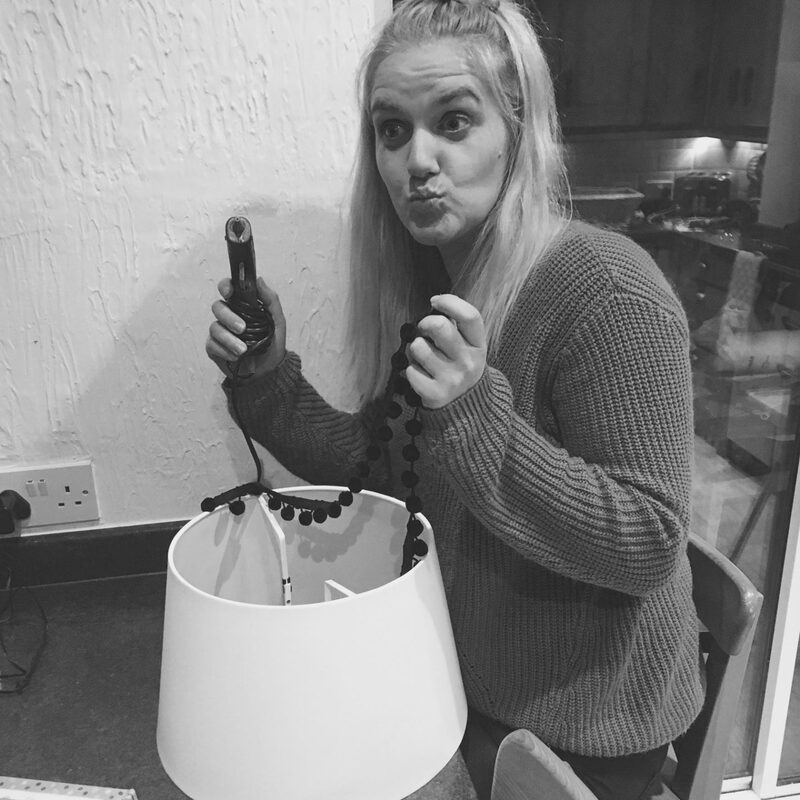 And hey presto – a beautiful and stylish light shade on a budget! Having a beautiful home doesn’t have to cost a lot when you adopt a thrifty mentality. You can have lovely things, your own individual style, and create beauty on a budget with a little planning and shopping around! I love our new porch and can’t wait for the next project! Debenhams wishlist and vouchercloud codes!